Bi-fold doors are a great way to bring a whole new look to your home and give you new ways to enjoy opening up a room to the summer sun. 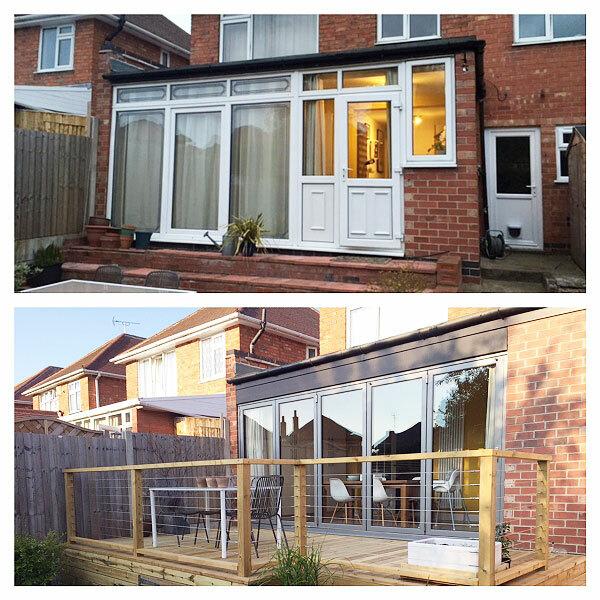 We’re particularly pleased with the effect that a stylish choice of aluminium bi-fold door had on this customer’s house, creating a contemporary look that, combined with new decking gives them a flexibility to enjoy their leisure time. A low threshold gives even floor level finishes inside and outside which helps to create an even better sense of space. 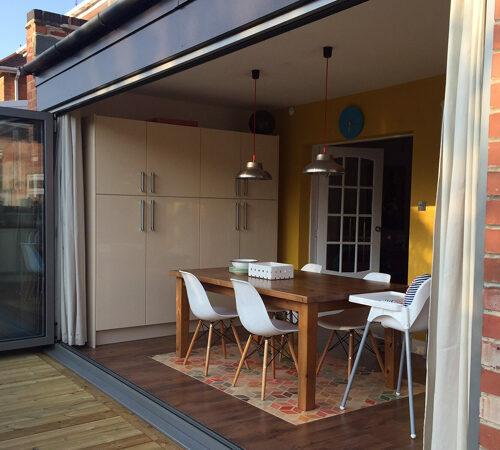 Bifold doors are simple and seamless to use, opening smoothly on a free-glide roller system with just a gentle push. This house has five doors which accommodate the width of the extended area of the property but you can choose a configuration of between two and eight doors – whatever best suits your home. Bifold doors aren’t only for the summer, of course. In winter they let in precious daylight whilst keep the cold and wet firmly outside. Origin doors’ thermal efficiency significantly surpasses the British Building Regulation requirements keeping you cosy in the depths of winter whilst still allowing you to enjoy a view of your garden. They are highly secure too with a unique 8-point locking system with linear bolts, deep-throw security hooks and strong hinges which give maximum compression to ensure that the doors are both secure and weather resistant. 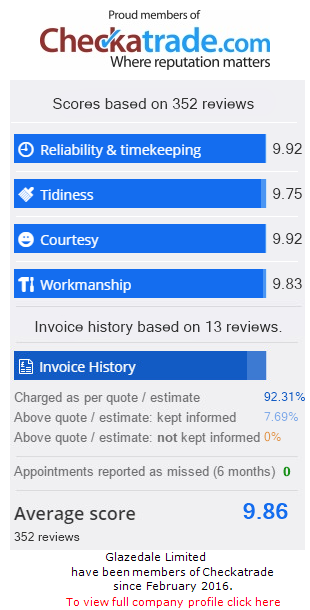 Because Origin use only premium grade aluminium, you can rely on the frames to be strong and durable whilst still being narrow enough to create the largest glazed area possible to allow in plenty of natural light. At Glazedale we use Origin components because their quality standards match ours. They are durable, secure and energy-efficient and, of course, incredibly stylish as our pictures show.